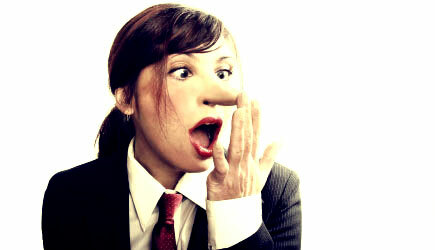 How can you tell if someone is lying? If you suspect that they are, how can you be sure? Some people just seem to have a sixth sense to tell who is telling the truth and who is fibbing. For the rest of us, this article gives a few basic signs that someone may not be telling the truth, the whole truth, and nothing but the truth. (P.S. Any lawyer can tell you that just because someone takes an oath to tell the truth and is told they may be fined or go to jail for lying does not mean they will be truthful). Last spring I took a fantastic class at Pepperdine with a very successful and acclaimed mediator for an instructor. This was not a run of the mill class where we studied strategies for overcoming impasse between parties or what “magic words” should be used for different scenarios. Instead, it was very interactive and had numerous elements of story-telling and psychology. One of the exercises we did involved liars. It went like this. Three women stepped outside and, without the knowledge of the rest of the class, two were instructed to make up a story and one was instructed to tell the truth. They came back in and sat in three chairs facing the class. Each proceeded to tell the story they had chosen. The first woman told a story about a vacation she went on with her husband. The scene she described was so generic it could have been read straight out of a travel agencies guide to any tropical destination—sun, sand, and snorkeling. Notably, this story lacked practically any real detail or specifics regarding her vacation. It was relatively easy to tell she was not telling the truth. Most of the class thought she was lying, but not everyone. The second woman told how she was a college athlete and had a scholarship to play tennis for the university she attended. She related that during her senior year she developed tendonitis and was not able to become a professional tennis player for that reason. When asked what sort of string she used for her racquet, she replied “80 pound.” Just over half the class thought she was telling the truth. The third woman told how her friend had recently visited from France, and she had taken him and his two kids to Disneyland. She told us the rides they went on and their itinerary while they were in the United States. When asked, she knew the name of her friend and both of his children, which, sure enough, had French names. Most people in the class correctly presumed she was telling the truth. The only woman who told the truth was the third. What was interesting in this exercise was (1) the spectrum of how easy it is to tell if someone is lying or telling the truth (sometimes easy, sometimes hard) and (2) that in a class of 20 there was not a single woman that got a consensus vote that she was either lying or truthful. This clearly illustrates that determining who is making up their story as they go is no easy task. Here are some of the guidelines the class reported using to determine whether each woman was telling the truth. As to the first woman, she did not include enough detail in her story to be believable. Additionally, she had a broad smile that turned down at the corners, as if she was trying to reduce the smile, and she talked out of the side of her mouth, which she did not normally have a habit of. Her voice was also unnaturally high pitched and loud and a little bit shaky; she seemed to be on the verge of laughter throughout her story. As to the second woman, her face color fluctuated between her normal tone and various shades of red. Her eyes shifted their focus almost continuously and her gaze was toward the ground throughout most of her story. Her hands were very fidgety and never stopped moving. Also, she was sitting with one leg crossed so that her one foot was on her other thigh, and the foot below that thigh was flexed such that all of the weight of both legs was borne by her calf and the ball of her foot. This looked incredibly unnatural. As to the third woman, who was telling the truth, her entire demeanor was slightly calmer. Interestingly, her foot was fidgety also but it was qualitatively different than the tensed foot of the second woman—it comported with the nervousness one would expect when speaking in front of a class. Also, she was calmer, more direct, and provided many more details than either of the others.